Thursday April 2nd 1895 I finished the ironing and cut out two shirts for Will in the forenoon. I sewed all the afternoon and read and knit in the evening. Friday April 3rd 1895 I got through with my work in time to sew a little in the forenoon. I churned soon after dinner and was jist ready to sit down to sew when Mother & Hattie came to stay awhile. Miss Linder went home tonight. I finished Will's shirts. It was late when we had supper. 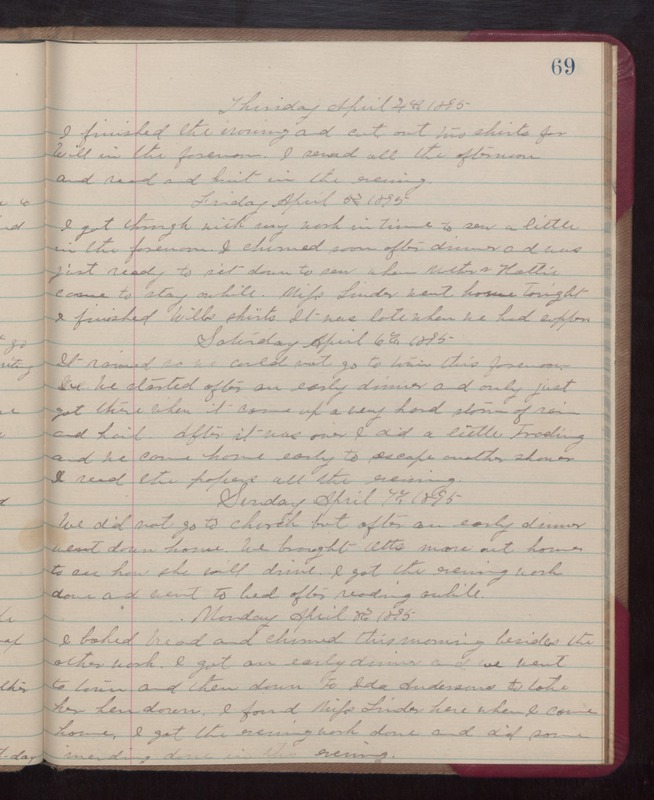 Saturday April 6th 1895 It rained so we could not go to town this forenoon. We started after an early dinner and only just got there when it came up a very hard storm of rain and hail. After it was over I did a little trading and we came home early to escape another shower. I read the papers all the evening,. Sunday April 7th 1895 We did not go to church but after an early dinner went down home. We brought Otts mare out home to see how she will drive. I got the evening work done and went to bed after reading awhile. Monday April 8th 1895 I baked bread and churned this morning besides the other work. I got an early dinner and we went to town and then done to Ida Andersons to take her hen down. I found Miss Linder here when I come home. I got the evening work done and did some mending done in the evening.